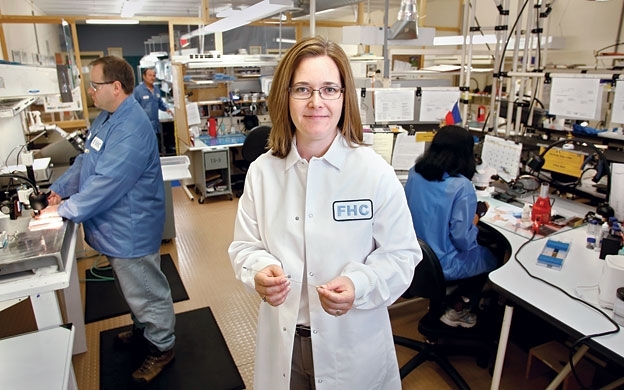 FHC, Inc., a small-business exporter in Bowdoin, Maine, is the first company to use EXIM's innovative Express Insurance product to increase its foreign sales and expand into new countries. This company researches, develops and manufactures microelectrodes for medical recording. The company has approximately 85 employees, mainly in Bowdoin and in Greenville, Pa.
Express Insurance has been developed for qualified small businesses. It features a streamlined application and both a policy quotation and two foreign-buyer credit indications up to $300,000 within five business days. EXIM Bank's insurance policy covers up to 95% of exporter's nonpayment risk and gives exporters the ability to offer financing for short-term international sales. This first-time EXIM Bank customer is now insuring its exports to buyers in Argentina, Chile, South Africa and Italy with the help of EXIM. Insurance broker, Trade Acceptance Group (TAG) of Edina, Minn., introduced FHC to EXIM Bank after the broker received a U.S. supplier referral request from an Argentine customer. "Initially, I thought that the main advantage was the ability to offer 60-to-90-day terms without the fear that we could be losing a $100,000 piece of equipment. But since we started with EXIM's Express Insurance, our export business has exploded with sales opening up in countries and a continent where we had never done business before. The opportunities are limitless for us. We anticipate adding jobs when we exceed our present capacity to handle the new demand."